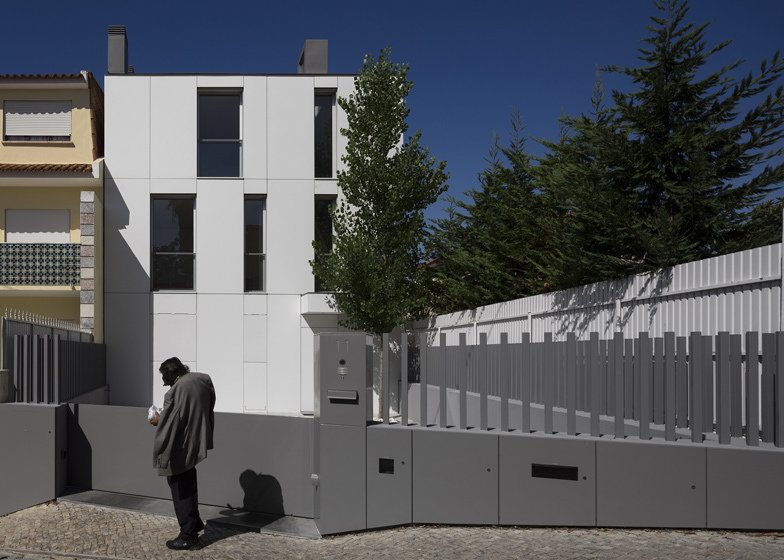 Hinged panels discretely integrated into the facade of this house in Parede, Portugal, by Lisbon architect Humberto Conde protect the property when the owners are away. (+ slideshow). 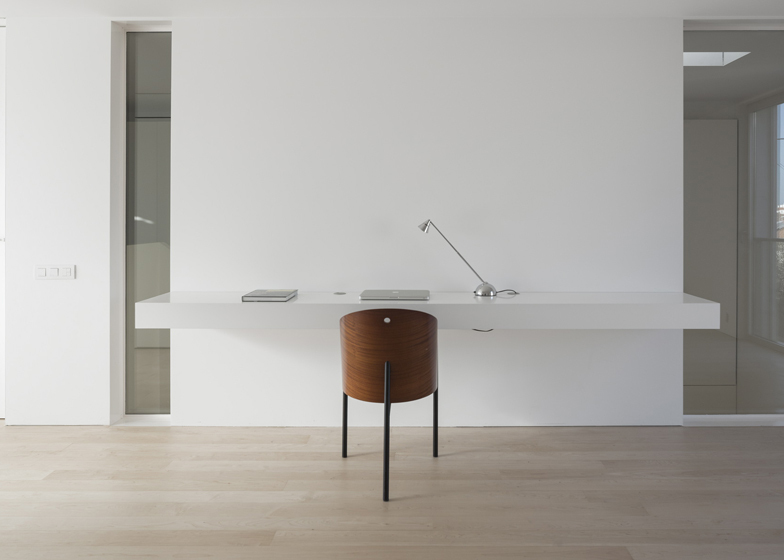 Humberto Conde designed the family home for a narrow plot next to a three-storey property that informed the overall dimensions of the new building and the position of its street-facing elevation. 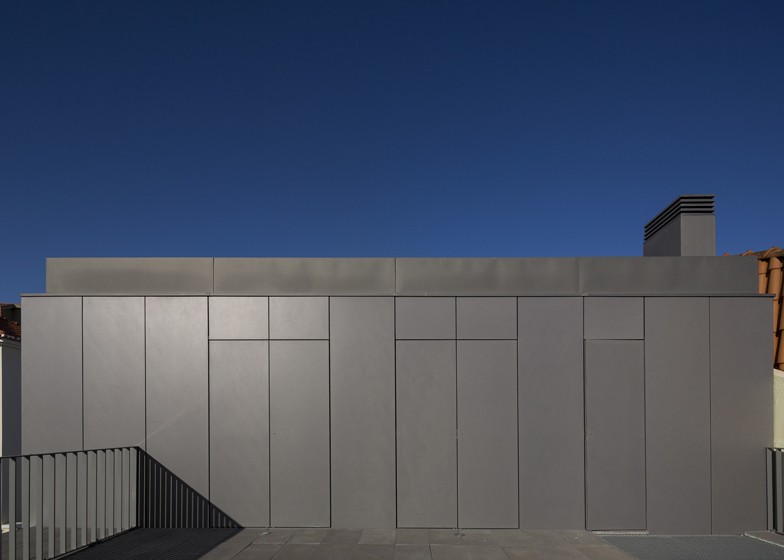 To the street, the house presents a minimal facade covered in cement panels and punctuated by narrow vertical windows. The hinged shutters fold down to conceal the windows, protecting the property at night and when the family is on holiday. "The new building promotes a dialogue between the surrounding area by a language of contrast in its image and shape regarding all the spatial articulation principles that mark the adjacent building," said Conde. At ground-floor level, the entrance is shielded by a small boxy canopy, while the hinged shutters that conceal the kitchen and laundry can be folded upwards to admit natural light and views toward the street. The gently sloping courtyard at the front of the house provides space for parking two cars, while a large patio at the back is surrounded by vegetation and incorporates a lap pool that is illuminated at night. A long corridor leads from the entrance to the kitchen on the left and into the main living and dining area, which is connected to the garden by full-height sliding glass doors. A staircase located to the right of the entrance ascends from the corridor to a first floor containing two bedrooms. Next to the master bedroom is an antechamber between the dressing area and en suite bathroom, which contains a square, swivelling window. 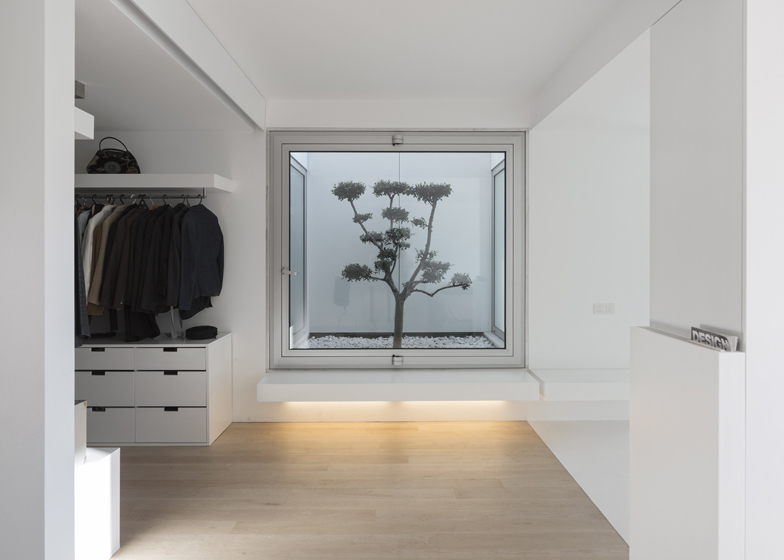 This window looks out at a sculptural tree in a sheltered courtyard with frosted windows on either side, allowing light and ventilation to reach the bathrooms. A door from the master bedroom provides access to a balcony overlooking the garden at the rear of the house, which projects over the patio below to shade the living spaces. On the second floor is a third bedroom and doors that open onto a large roof terrace. 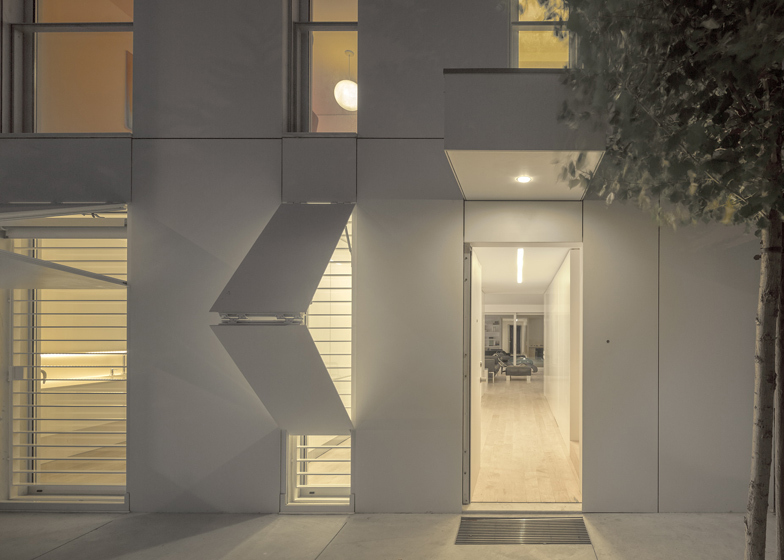 Similarly to the hinged panels on the house's minimal front facade, these doors sit flush with a dark wall that gives the terrace a contrasting appearance to the rest of the white exterior. 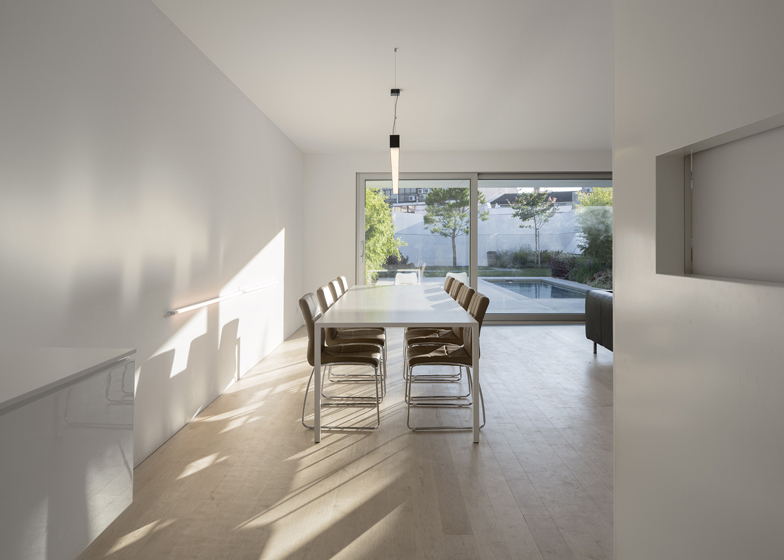 The project aims to develop a single house located in the centre of Parede, Cascais, in a site characterised as Historical Urban Space. The lot of the house as a particular elongated and thin configuration like the adjacent lot on the left side - south. The nearby buildings are part of a summer houses morph-typological group that proliferated in the Portuguese coastline in the 40s, 50s and 60s. These houses were usually built as second houses or summer residences, presenting, in general, a garden that involves them throughout their perimeter. The exception is made in smaller lots of recent date where it was usual the implantation of terraced houses, as a way to potentiate the opposite top sideband. In this particular case, given the lot's configuration and taking into account the adjacent house (with three floors above the ground and one basement), we believe that the new construction should certainly be marked out through these alignments, namely the build's height, volumetry and the alignments of the main facade. The new building should promote a dialogue between the surrounding area by a language of contrast in its image and shape regarding all the spatial articulation principles that mark the adjacent building - as well as by the used construction details, such as window openings, metric of the facades and visual relation with the exterior. Safeguarding a small courtyard at the entrance of the house - access area to the parking lot and the house - that assures the alignments, the new building is developed in three floors above ground, freeing at the back (West), a green space which is in direct relation with the social spaces of the house. There's a longitudinal corridor, delimited by the contiguous lots' walls, with the introduction of a single vegetable element - a tree - allowing the automobile and pedestrian access to the interior of the housing. It's also considered the interest in maintaining the permeability of the soil by applying a large green surface at the back of the house. This will allow the infiltration of a significant percentage of rainwater and the optimisation of the access to the infrastructure network derived from extensions installed on the public road. At the ground floor level are the social spaces of the house. Through a central corridor, which serves as the house's entrance hall, it's made the distribution to the different spaces of the house. On the left side of the hallway are the kitchen and clothing treatment areas, accessed laterally. In front is the living room, a big space that establishes a close relationship with the exterior, through the use of a garden. Finally, on right side of the corridor are the staircases for the upper floors - the private spaces of the house. Reaching the first floor through the distribution staircase, located on the right side of the house's main access, we've got two bedrooms equipped with their own private bathroom and closet. Both bedrooms are naturally lit through the openings located on the East and West facades, having been also created a small outdoor garden to canalise natural light and ventilation of the bathrooms of both bedrooms. 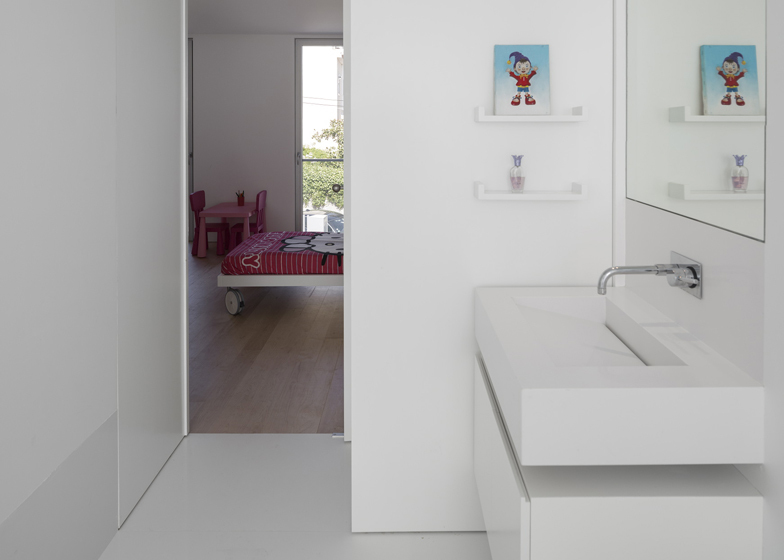 The second floor consists on a single space - the third bedroom and a bathroom. 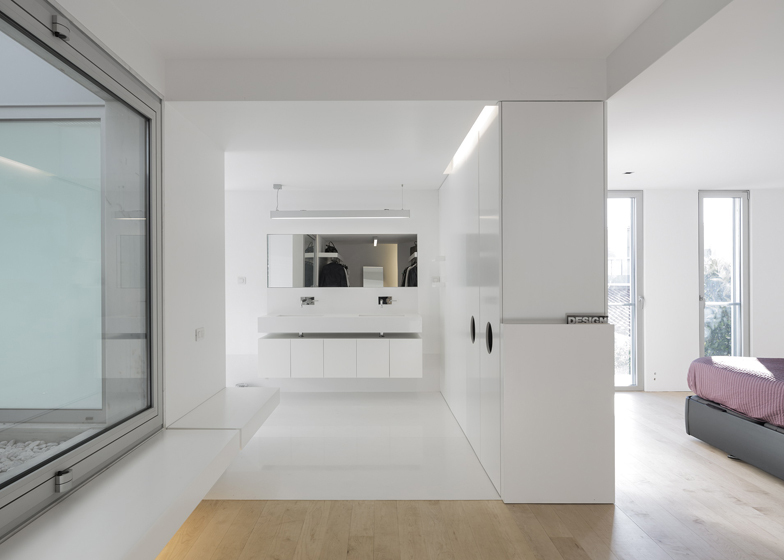 Both spaces enjoy natural light and a strong relationship with a terrace facing the West, where a tree coming from the garden on the lower floor emerges.